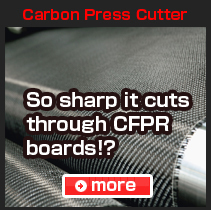 HSCD is the first and only cutting die in the world that enables you to cut out the CFRP and such Super Fibers as Kevlar, Dyneema, Zylon, Vectran, Twaron, Technora and Alamid, which are generally taken difficult to cut out. 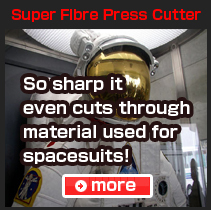 You can use it with an ordinary press cutting machine as it is. 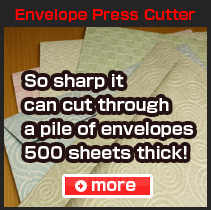 When HSCD is used for envelope, it shows its excellence to cut through a pile (400 – 500 sheets) of paper at once precisely with minimum error of the size less than 1mm between the top and the bottom sheets. This preciseness means HSCD is suitably applicable to automation process of the folding. The technology of wisdom and skill is here! In order to trim, punch and cut out the formed (molded) parts, we developed 3D HSCD including that of three-dimensionally curved blade which the machine cannot process. Keeping its sharpness and durability, it cuts out the formed parts no matter it is before or after the coating. This 3D cutting die is possible only by our technology in the world. The superior technology is here! It is obvious in the macro photographs above that HSCD blade seldom causes nick under normal use while the ordinary blade processed by the machine causes it. Superiority of our craftsmanship to ensure the sharpness is proven in the photos. * The photos are by Industrial Technology Center of Ehime Prefec. Are you satisfied with your current cutting dies you use to cut paper, plastic (film), rubber and leather? HSCD is the forged cutting die by our craftsmanship (hand-made one) in combination of traditional Japanese blacksmith technology and our own innovative technology. Your inquiries for the modification or re-grinding are welcome.